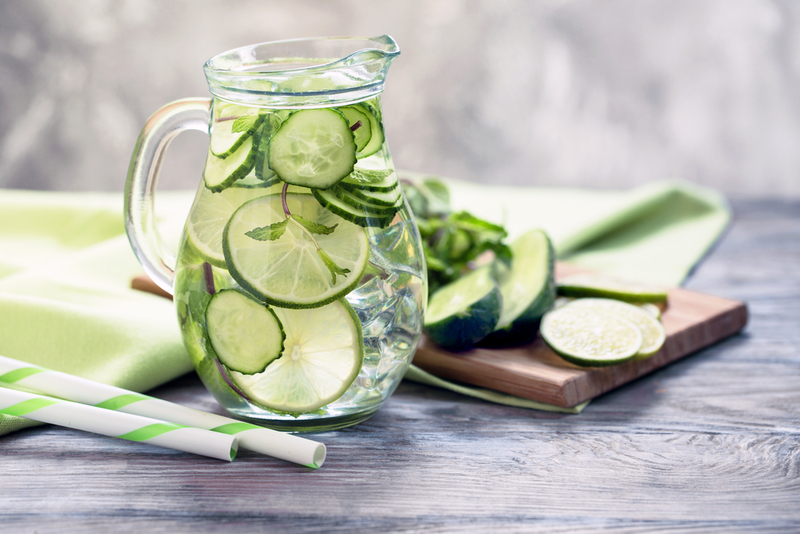 Since summer is still here, and we’ve discussed the importance of water hydration in our article on Kangen Water, we thought we would add a refreshing twist to drinking water by infusing it with cucumbers. It’s not only pleasurable, it adds a little something to your regular glass of water while keeping you away from unhealthy soda drinks! There are many benefits to drinking infused cucumber water, so we’ve collected 8 worthy reasons to add it to your routine. The truth of the matter is that most of us really don’t drink enough water even though we really want to. Cucumbers are made of 95% water and have two compounds in them, ascorbic and caffeic acid – both avoid water retention. As a result of its high water content, it enhances your body’s hydration and easily flushes out toxins. And since it actually tastes so good, it might be easier to drink more water on a daily basis. Adding mint or lemons to the mix might make it even more thrilling. Drinking this infused water is an excellent way to give your body the feeling of being full. Often our hunger pains are simply a lack of hydration. Drinking cucumber water will prevent you from overeating and snacking between meals, as it will naturally curb your appetite. Making cucumber water (or juice) is full of antioxidants and boosts your metabolism and besides, they’re very low in calories. The key to healthy skin is staying hydrated and the silica, antioxidants, and anti-inflammatory properties in cucumbers all help the skin stay clean, supple, and reduce inflammation. The antioxidants neutralize free radicals that reduce oxidative stress that lead to wrinkles and blemishes. It’s also believed to act as a natural remedy for treating acne and, at the same time, it cools the skin and body temperature. Cucumbers have been used topically on the skin and eyes as a toner or mask, so you can add that to your cucumber enthusiasm. The silica in them is the magical mineral that keeps your hairy shiny, nails stronger and also helps with eczema. Cucumbers are full of antioxidants, like Vitamin C and beta-carotene, as well as antioxidant flavonoids and cucurbitacin, that all help your body fight cancer. One research found that cucurbitacin lowers prostate cancer specifically. It’s one way to add more content to your water and it becomes an addition to your healthy diet while keeping you cancer-free! Not bad at all! 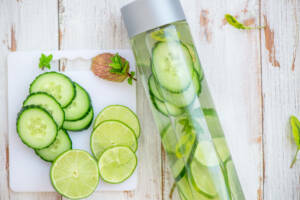 Many people are given cucumber infused water as part of a detox-cleanse, because cucumbers are a natural diuretic, which assists in passing toxins through urine. Drinking cucumber water is a mild and stable practice to detoxifying your body on a regular basis rather than one giant detox-cleanse. Most of us are not professional athletes but we still need to maintain and build muscle strength. We need muscle strength for metabolism, posture, joints, healthy sleep and mental wellbeing. The silica found in cucumber is a mineral that helps the health of muscle tissues, as well as muscle growth and overall tone. You can add cucumbers to your water bottle that you take to the gym too. Cucumbers are rich in Vitamin K, which aids the transportation of calcium to bones and prevents blood clots. One single cucumber equals 22% of your daily-recommended consumption. It’s important to note that vitamin K is most condensed near the skin of the cucumber; so peeling it reduces the amount you will receive. The silica and manganese also strengthens bones. Most of us worry about blood pressure, as it is vital to keeping away strokes, heart attacks, and kidney disease. The high level of potassium in cucumber water will help maintain healthy blood pressure levels and it’s sodium free to boot. Not bad for a little cucumber! The next time you have guests over, you can offer infused cucumber water because it looks so energizing and it keeps your breath fresh too. On top of it, EWG’s Dirty Dozen list removed cucumbers, so even if you buy organic ones, they are one of the cheapest veggies you can buy. We hope you have fun adding all these extra vitamins and minerals to your daily water intake. Oh, did we mention you could also add them to your gin & tonic cocktail too? Keep cool with the cukes! Sophia is a photographer, sound therapist, traveller and freelancer. Her background in Western Culture and Society, Communication Studies, and Fine Arts Photography allows her to love all things multi. 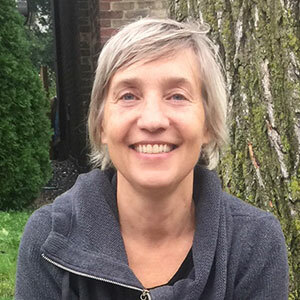 In her sound therapy work, she uses a variety of modalities, such as Sound Healing, Reiki, Complete Cellular Mind Body Alignment (CCMBA) and The Black Pearl Technique (a mix of chinese meridians and use of chi (prana) energy), aromatherapy and crystals. She continues her studies with The Foundation for Shamanic Studies, helping her connect with spirit and earth. She’s currently exploring writing, sound, yoga of sound, ecstatic dance and photography while travelling in search of universal truths. Hey Sophia, thanks a lot for sharing! 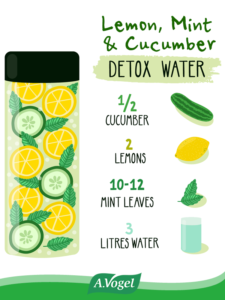 Cucumber infused water is the king of all detox drinks! The recipe above is perfect for these hot summer days. I sometimes add a few pieces of fresh ginger for additional health benefits. Also, lemon balm fresh leaves give it a special twist. You are welcome. Yes, I love the combination mixes to. Not only are they tasty, they look exquisite! Cheers! Subscribe to our email newsletter today to receive updates on the latest news and blogposts!